IMPORTANT: This firmware update is only for a DSC-H2 Cyber-shot camera that has a serial number that falls in the range from 3500001 through 3534250, and has Version 1.0 of the firmware installed. The process for upgrading the firmware is to download the compressed firmware file to your computer (Mac OS 9.1, 9.2, or X 10.3) and then copy it over to Sony Memory Stick Duo™ media. The media is then inserted into your camera and a series of steps are taken on the camera to complete the installation. Only DSC-H2 cameras that meet the criteria for both the affected serial number range and current firmware version should proceed with this firmware update. Follow these steps to check your serial number and firmware version. The serial number is located on a sticker on the bottom of the camera. If your serial number falls between 3500001 through 3534250, then it may need the update. Please continue with step 2 below to check your camera firmware version. If your serial number does not fall between 3500001 through 3534250 then this update is not needed. Refer to the image shown below for the location of the various buttons and controls needed to perform the required steps. Make sure the camera is powered off. Press and hold the "Menu" button. While holding the "Menu" button, press and release the "Playback" button. Continue holding the "Menu" button for at least 2 seconds. NOTE: When the "Cyber-shot" screen disappears, release the "Menu" button. 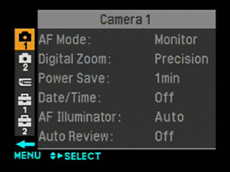 Press the right side of the Control button one time to display the [Camera 1] screen. 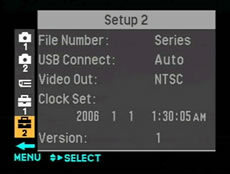 Press the lower side of the Control button to move down through the screens until the [Setup 2] screen is displayed. If Version 1.0 is listed AND your camera's serial number falls into the affected range (3500001 through 3534250), please proceed with the setup below to download and perform the firmware update. This firmware update is not necessary. WARNING!! : This utility is only for use with the Sony® DSC-H2 Cyber-shot® digital still camera. Do not install this utility with any other model of Cyber-shot camera. Supplied Batteries or the AC-LS5K AC Adaptor (purchased separately) - Ensure the batteries are fully charged or the AC adaptor (not supplied) is plugged into a working outlet. WARNING!! : Update functionality is not guaranteed if you use any other USB cable. 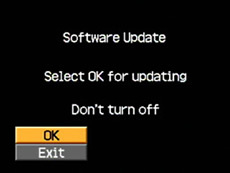 Performing the firmware update will return all settings, except [Video Out] and [Language], to the default settings. To restore your personal settings, you will need to set them again. WARNING!! : The file number of the next image to be recorded will be reset to "DSC0001", regardless of the images previously recorded. If you have already recorded images with the camera, newly recorded images may have the same file numbers as images previously recorded. Take care to avoid file name conflicts and to avoid overwriting previously recorded images when transferring images to your computer. Download the DSCH2V2.sit file to a temporary or download directory (please note this directory for reference) on your computer. Go to the directory where the file was downloaded and double-click the DSCH2V2.sit file to begin the extraction. One file named DSCH2V2.ASH (3.00 MB) will be extracted. NOTE: Depending on your operating system, the file may have automatically extracted while downloading. Format the Sony Memory Stick Duo media with the camera. WARNING!! : The Memory Stick Duo media must be formatted in the camera. All data on the recording media, including even protected images, will be erased by formatting and cannot be restored. Copy the firmware update file (DSCH2V2.ASH) to the Memory Stick Duo media with one of the procedures below. These procedures vary based on your computer configuration. Insert the camera-formatted Memory Stick Duo media into the memory card slot of your computer. Copy the update file (DSCH2V2.ASH) to the Memory Stick Duo media. Connect the memory card reader to the computer. 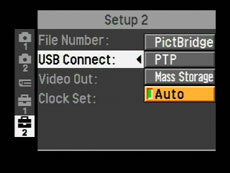 Insert the camera-formatted Memory Stick Duo media in the memory card reader. Insert the camera-formatted Memory Stick Duo media in the appropriate slot of your camera. Set the mode dial to (Auto adjustment mode), and turn on the power. Press the "MENU" button to display the menu. Press the right side of the Control button one time to move into the [Setup 2] screen. In the [Setup 2] screen, set [USB Connect] to [Auto]. 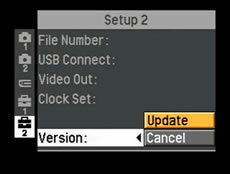 Copy the update file (DSCH2V2.ASH) to the recording media inserted in the camera. When the access lamp near the /CF switch stops blinking, copying is finished. Turn off the camera, and disconnect the USB cable. If the camera is connected to the computer with the USB cable, disconnect the USB cable. If not already there, insert the recording media Memory Stick Duo media containing the update file (DSCH2V2.ASH) into the camera. Make sure you are using batteries that are fully charged or that the AC-LS5K AC Adaptor (purchased separately) is plugged into a working outlet.. If the menu is not displayed, press the "MENU" button. 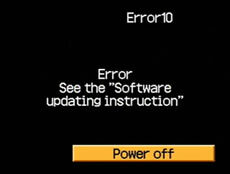 If [Version] is not displayed, turn off the power and redo this section of the procedure (Set the camera to update mode). If "2" is displayed in [Version], this update is not required. Regardless of what is displayed in [Version], this update has already been implemented for cameras with a serial number that is not listed in the applicable serial number ranges. You do not need to update the firmware if your camera's serial number is not listed in the applicable serial number ranges. Use the Control button to select [Version], and then select [Update]. NOTE: The "Access" screen briefly appears. 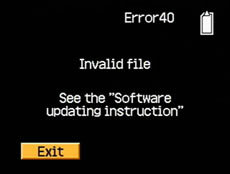 Cause: The firmware update file does not exist in the recording media. Solution: Check the contents in the recording media with the computer, and then redo the entire Software Updating Instructions procedure. Cause: There are multiple files or folders on the Memory Stick media because it was not formatted before the firmware update file was transferred. Solution: Format the Memory Stick media in the camera, and then redo the entire Software Updating Instructions procedure. Cause: The contents of the file in the recording media are invalid, its version is not newer than the original version, or the firmware is for a different model camera. Solution: Check the version of the firmware in your camera and, if necessary, download the correct firmware, and then redo the entire Software Updating Instructions procedure. 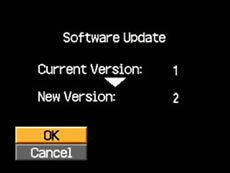 Check the version to be updated, and if it is correct, select [OK] to start the update. NOTE: If you select [Cancel], the "Setup" screen appears again. Select [OK] to start the update. During the update, the following "Updating" screen appears and the circle signs will blink. 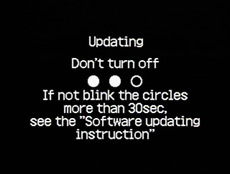 NOTE: When all three circles are lit, the update is finished. Cause: The update may have failed. Solution: Contact a nearest Sony service center listed on the back of the camera's warranty card. When the update is successfully finished, the "Finished" screen appears, power off the camera. After you set the clock, the menu is displayed. Check to see if the firmware version is updated. If the version has successfully been updated, go ahead and reformat the Sony Memory Stick Duo media to remove the firmware update file. NOTE: If you need assistance, please call Sony Support at 1-800-222-7669 (US customers), or Sony Canada Support at 1-866-215-6663 (Canadian customers).